Challenge Coins are a tradition that started during WW-II. The first coins were issued to battalions as symbols of camaraderie and unity, and have been prized by Veteran’s ever since. Over time the "challenge" came when the service member having a coin to show proof of membership in a campaign, battle group or event. Challenge Coins are often traded between service members and are a great source of pride. 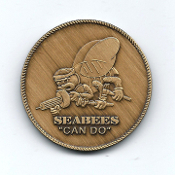 Our beautiful challenge coin was originally struck when the Seabee Museum at Davisville was started. The front design, a Fighting Bee, is authentic to Frank Iafrate's design. Note the rolled down sailor's cap. The back of the coin shows an early concept of the main museum building. We only have a very limited supply of this desirable challenge coin. When they are gone, we will not be reordering. Challenge coin collectors, Seabees and friends of the museum ... don't be disappointed, order your coin today.